Are you ready for a blast? What is the secret behind the reaction between carbonated cola and little mint candies that makes such an explosion? Try it! Ask student to create a testable question (a hypothesis). Example: Will different numbers of Mentos® change the reaction? Place a 2-liter upright, with plenty of space around. Remove the Mentos® from the wrappings. You will use one whole pack for each 2-liter bottle, and will need to drop each pack into the bottle all at once. You can use a rolled paper tube or other funnel device to help do this quickly! Ours were commercially available “Geyser Tubes” purchased online. Working as fast as possible, open your soda bottle, and drop the whole pack of Mentos® into it. Step back and observe the explosion! Why must we use original Mentos® and not fruity Mentos®? What is different about the original flavor mints? It has to do with how the mint Mentos® are made. The fruity ones have an extra coating that makes their surface smooth, thus slowing down the reaction. The mint Mentos® have divots in the surface that catch the ingredients in the diet soda just right to set off the biggest explosion! What is in soda that may help create the eruption as shown in the video? Sugar helps cause the reaction, but the aspartame in diet soda causes the biggest reaction. Caffeine, surprisingly, has no effect on the reaction. What usually causes soda to erupt in this way? Why do you think the Mentos® are able to elicit a similar reaction? Shaking the bottle before opening it - the Mentos® act as a catalyst (something that speeds up a reaction), causing the soda to become oversaturated with carbon dioxide and explode. Is the evidence and data you are collecting helping you test your question? Answer depends on the scientist. If you are modifying variables, ask students what the differences are in the reactions between the modification of variables. How quickly did the reaction start to happen? How quickly did it stop? Answers will depend on your specific experiment. How high did the eruption reach? Would this experiment work with juice? Why or Why not? Will different candies such as life savers have the same reaction as the Mentos®? Why or Why not? A carbonated beverage, like soda, is packed with carbon dioxide gas that is dissolved into the soda solution and bonds with water. While the soda is in the bottle, the gas is kept in solution by the pressurized conditions inside the bottle. To create bubbles, the carbon dioxide needs to interact with itself, which means that its bonds with the water in the soda must be broken. A Mentos® candy can help with this. Each Mentos® candy has thousands of small pores on its surface which disrupt the polar attractions between water molecules, creating thousands of ideal nucleation sites for the gas molecules to congregate. This means that each tiny pore acts like a place where the physical reaction can get a kick start; this is where a bubble of carbon dioxide gas can form and escape! As the Mentos® candy sinks in the bottle of soda, the candy causes the production of more and more carbon dioxide bubbles. 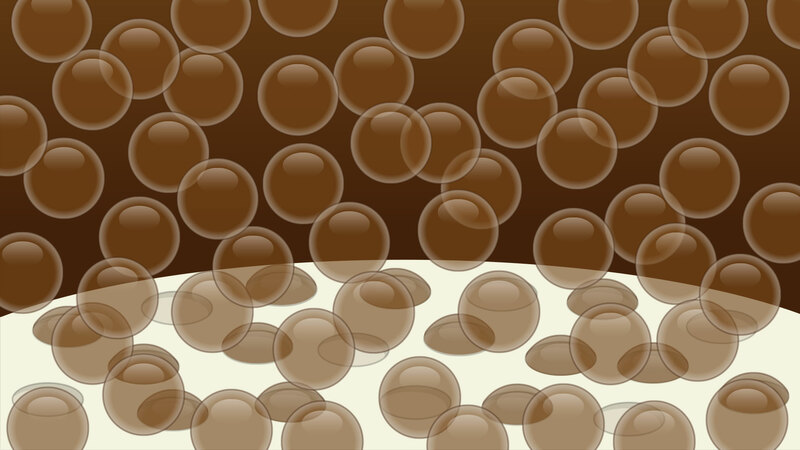 The buoyancy of the bubbles and their growth will eventually cause the bubbles to leave the nucleation site and rise to the surface of the soda to escape. Bubbles will continue to form on the porous surface and the process will repeat, creating an enormous foamy geyser! A sudden violent spontaneous occurrence. A geyser is a spring from which liquid and/or steam is ejected forcefully into the air at varying heights. Nucleation is the process where droplets of liquid can condense from a vapor, or bubbles of gas can form in a liquid. Nucleation sites assist the physical separation of solid, liquid, and gas. 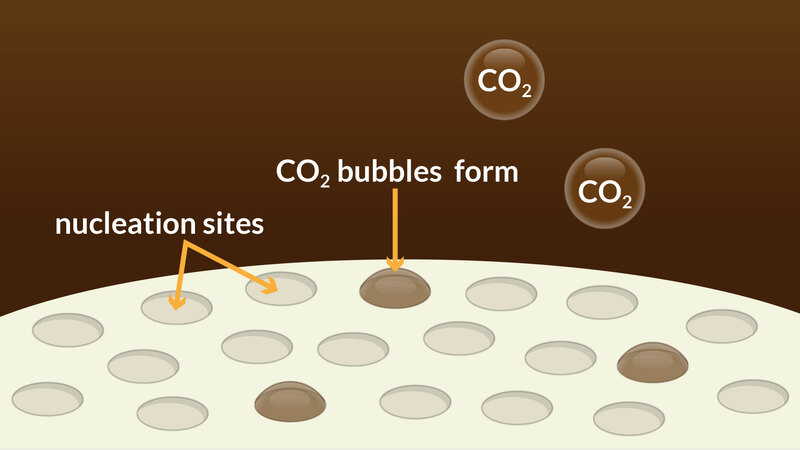 In this experiment, the Mentos® covering has tiny pits serving as a nucleation site, where carbon dioxide can form and escape.